Treat someone this holiday season to our elegant Snowman Christmas Gift Basket filled with delightful holiday treats ! 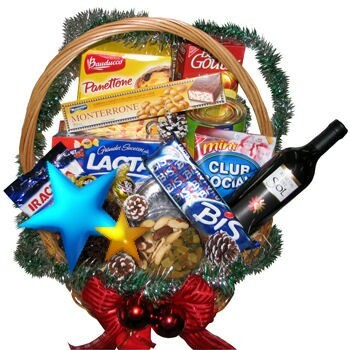 Make an elegant and impressive statement with this incredible gift; the Snowman Christmas Gift Basket contains a 500 gr Italian Panettone Christmas cake, which is a Christmas fruitcake Brazilians enjoy, a variety of crystalized fruits, hazelnuts, almonds, walnuts or pistacchio nuts, dried plums, raisins, a bottle of good 750 ml red wine, assorted luxury chocolates and cookies and salty biscuits.Exclusive wrapping, gift basket or gift box by Floresnaweb. The Snowman Christmas Gift Basket is decorated with Christmas colors and themes, and is delivered wrapped in cellophane paper with beautiful Christmas colored ribbons.